We had a great meeting on Friday, April 29. We held our bi-annual contest with lots of great entries. See below for the full list and results. Donate a kit for the raffle. It does not have to be shrink-wrapped, but it should be new and complete. 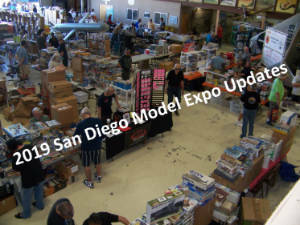 Sponsor a category – for only $25 your name will go down in San Diego modelling history! Judge – Volunteer to help judge a contest category. You will be paired with other judges. No experience is necessary. You can still judge if you have entered a model; you just cannot judge a category in which you have an entry. As noted by Bob Ekstrom, our Second Vice-President, if you will be judging, it is helpful to bring a small flashlight. Contact our Lead Judge, Jerry Jackson if interested. Photograph a category – We are looking for people to help us photograph models at the Expo. If interested, please contact Ethan Idenmill for details. The Contest Committee held their second-to-last status meeting before the main club meeting. Bob Ekstrom, our Second Vice-President, chaired the meeting. Gary Williams, our Treasurer gave his monthly report. Joel Hendricks, our Secretary gave his monthly report. Marty Horvath built a 1/285 scale B-52 bomber in its 1972 configuration. He added pictures of then-President Nixon to give it historical flavor. Marty Horvath's B-52, 1/285 scale. Luis Barron brought in his 1/72 scale Italian M13/40 Carro D'Armato Italian Tank. Luis Barron's 1/72 M13/40. This is from an Italieri kit. Dustin Ferris brought in a kit-bash of a Gundam and an F-4U Corsair. David Weeks brought in three kits - a 1/48 FM-2 Wildcat, a 1/48 TBM-1C Avenger, and 1/72 scale Mercury-Atlas kit. David Weeks' FM-2 Wildcat, 1/48, by Sword. This is a limited run kit that requires lots of modelling skill. David Weeks' 1/72 Mercury-Atlas kit by Horizon Models. Tony Beres brought in a 1/48 P-40 Warhawk. Tony Beres' 1/48 P-40 Warhawk. David Hansen brought back his 1/32 Tamiya F4U-2 Corsair. David Hansen's 1/32 F4U-2 Corsair (Tamiya kit). Bob Ekstrom brought in a 1/32 FW-190 A8 (Revell kit). Bob Ekstrom's 1/32 FW-190 A-8 (Revell kit). Mike Potter brought in a 1/144 PBY Catalina from Academy. Mike Potter's 1/144 PBY Catalina. John Ball brought back his Ferrari F1 (1/24 scale, Revell kit), which he entered in our bi-annual contest. The materials that came with John Ball's Ferrari F1 (1/24 scale, Revell kit). Jerry Jackson brought in three models - a 54mm Australian soldier, a 1/76 Soviet Su-85 and a 1/35 German pilot. Jerry Jackson's 54mm Australian soldier (Hornet kit). Jerry Jackson's 1/76 Su-85 (Fujimi kit). Jerry Jackson's 1/35 German pilot (Hornet kit). Ethan Idenmill brought in a small fleet of 1/1800 ships that he ordered from Shapeways, a 3-D printing company. They are in various stages of completion, and are meant for wargaming. Ethan Idenmill's 1/1800 ships by Shapeways, including the IJN Fuso, IJN Maya and USS Texsas. David Nielen, our First Vice-President, brought in a 1/48 StuG IIIB by Tamiya. David Nielsen's 1/48 StuG IIIB (Tamiya kit). Marc Manuzon's 1/35 Academy M1A1 Abrams. Marc Manuzon's 1/35 AFV Club Tiger Tank. Ethan Idenmill's 1/72 Trumpeter Strv 103c Tank. Rich Durham's 1/35 Tamiya Panther. John Ball's 1/24 Revell Ferrari F-1. Gilbert Barron's 1/35 Tamiya Semovente. David Nielsen's Hasegawa P-40 Egg Plane. Dustin Ferris' 1/35 Tamiya M1A1. Richard Abraham's 1/48 Kitty Hawk Jaguar. Richard Abraham's 1/48 Kinetic AMX. Richard Abraham won second and third place in the aircraft category for his Jaguar and AMX, respectively. David Nielsen won first place in the aircraft category for his P-40 Egg Plane. Ethan Idenmill won third place in the armor category for his Strv 103c. Rich Durham won second place in the armor category for his Panther. David Nielsen won first place in the armor category for his Jagdpanther. Dustin Ferris won third place in the Juniors category for his M1A1. Marc Manuzon won second and first place in the Juniors category for his M1A1 and Tiger Tank, respectively. John Ball won first place in the auto category for his Ferrari F-1. John Ball also won Best in Show for his Ferrari F-1. Congratulations, John!